This is a well crafted and attractive wooden chair available with either a lovely soft lime wash or a gorgeously sumptuous gold sheen. A great choice for weddings as we offer a choice of seat pads in 6 popular colours meaning you can personalise the Chiavari chair to your event theme. 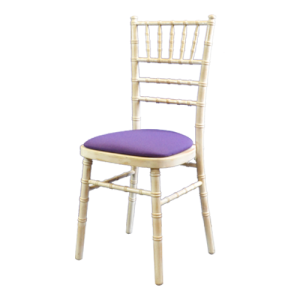 For the ultimate in Royal opulence, pair the gold Chiavari chair with a gold or purple seat pad! Comfortable, lightweight and stackable for convenient storage.